In North American folk medicine, eastern black walnut is highly valued thanks to the effective action of its natural ingredients. It contains polyphenols, juglone, carotene, vitamins C, B1, B6, F, E as well as essential oils, organic acids, tannins, and other substances. 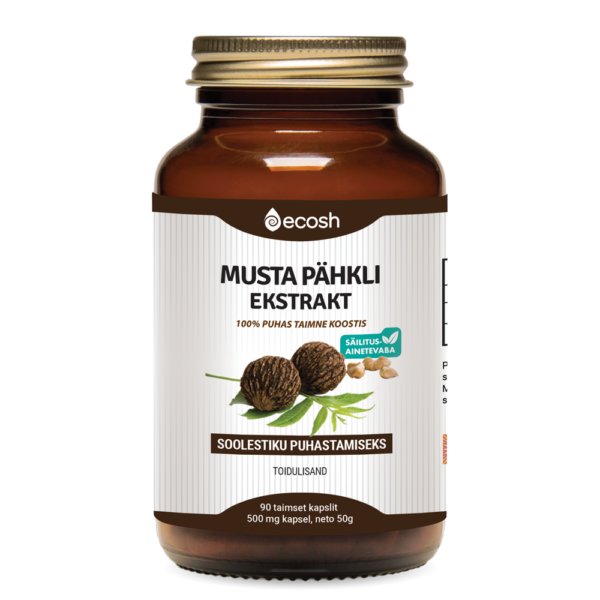 The active ingredient juglone contained in the eastern black walnut extract helps to free the organism from parasites, fungi, and harmful bacteria, and the active ingredient tannin helps to prevent the development of malignant processes in the gastrointestinal tract. Tannins help to form an impenetrable film in the intestine that isolates mucous membranes from damage and infections. It supports the strengthening of the body’s immune system. maintain normal cholesterol, blood pressure, and blood glucose levels. Eastern black walnut is particularly rich in vitamin C, which is why it is useful for people suffering from exhaustion. It contains eight times more vitamin C than blackcurrant and fifty times more than in citrus fruits, making it an excellent antioxidant. Ingredients: Eastern black walnut leaf extract (Juglans Nigra), vegetable capsule (hydroxypropyl methylcellulose). Administration: 1–2 capsules (4, if needed) a day with water, according to the recommendation of a therapist or a doctor. Take with water. Do not use for longer than two or three weeks. Recommended administration period: in courses. Warning: Do not use food supplements as a replacement for a balanced diet!